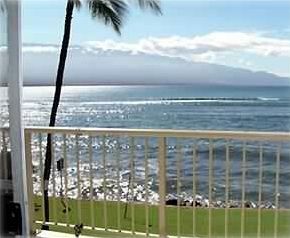 The Maalaea Kai condominium is located between the Ma'alaea small boat harbor and the Ma'alaea Beach. The four-mile, crescent-shaped beach is great for jogging, strolling, and whale watching during the winter. It parallels a US national park service bird sanctuary, which tends to reduce popular beach access. The beach, despite its beauty and panoramic views, is virtually crowd free. It is a three-minute walk to the Ma'alaea Harbor, Maui Aquarium, shops, and restaurants. Maalaea is known for its seclusion, but is only 15 minutes from activities in Lahaina and South Maui. Nineteen golf courses are located within five to 20 minutes from the condominium. Listen to the sounds of the ocean as you sleep. Dawn and Dean Theodore are pleased to welcome you to their home in Maui. Dawn was a flight attendant for United Airlines for 34 years as well as owning her own dance studio for 25 years and being a psychotherapist for the past 20 years specializing in the treatment of eating disorders. Dawn is an international speaker and the author of the book " TuTu Thin" A Guide to dancing without an Eating Disorder. Dawn teaches Master Classes of dance across the US at different dance studios. Dean was an occupational therapist who worked with children with developmental delays. He is a designer and also specializes in non anesthetic teeth cleaning for dogs and cats. Dean is on the board for an animal rescue organization, START. Dawn's mother lived on the island of Maui for 14 years. They enjoy boogie boarding on the island and walking on their favorite beach Keeawakapu. Many Mahalos fo visiting our condo. We fell in love with unit which was in the building where my mother owned a condo for the past 24 years. The corner unit with the views of Haleakala in the morning. You could not be closer to the ocean unless you were on it in a boat. I love hearing the waves crash all night long from the Master Bedroom. Centrally located to the entire island. Great ocean breezes! Tub and shower in Master and shower in the second bathroom. You could not be closer to the ocean than if you were on it in this oceanfront unit. On the floor, not in the unit. Well this was our 4th time staying here which kind of speaks for itself! Thank you Rob for your review. So happy you enjoyed the unit and hope you will return. Beautiful location, great sunrises and nice condo. Only here teo nights, but enjoyed the time we had. Condo is in very good condition, nice furniture and lots of kitchen supplies. Only problem was uncomfortable bed in second bedroom--maybe replace the mattress. Spectacular view from the balcony. I loved the ocean breezes and listening to the waves from the bedroom and lanai. It is so relaxing and just what I needed. The location is so centrally located to Lahaina and Kihei and the airport. I love the quiet street and views are amazing. I could not have been any closer to the ocean. This condo is in a perfect location. The views are awesome. Had so much fun watching the turtles right in front of our patio. Condo amenities are good, very comfortable for 5 people. Grounds are immaculate. We addressed some cleanliness issues with the owner, and she assured me it would be taken care of. It would be a 5 star then, and we would definitely stay here again. Already miss the views and sounds of the surf!!!! Rates Are Subject to Change Cancellation Fee of $100 plus Homeway fees if cancelled before final payment. After final payment, there are no refunds, unless we can rent the unit.